This is when the Night Master 800 v1 was born, which revolutionised lamping for many night hunters. With the NM800, there was no need for big lamps, separate battery packs and coloured filters. The NM800, with its internal battery and changeable LEDs, would fit neatly into a jacket pocket. 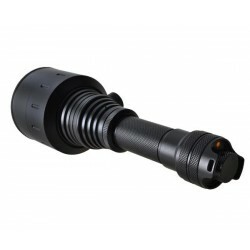 But despite its small, lightweight construction, it could pick out eyes up to 800m and allow identification up to 500m. It was the original... small torch, epic beam! Product description Control the night with the Night Master 800 IC. With ‘Intensity Control’ (IC) technology you can quickly adjust the brightness of the beam to provide enough illumination for spotting, identifying and shooting your quarry, whether it’s rats, rabbits or foxes. Product description Control the night with the Night Master 800 IC IR Illuminator. With ‘Intensity Control’ (IC) technology you can quickly adjust the brightness of the beam to provide enough illumination for spotting, identifying and shooting your quarry, whether it’s rats, rabbits or foxes. Product description Control the night with the Night Master XSearcher IC IR Illuminator. With ‘Intensity Control’ (IC) technology you can quickly adjust the brightness of the beam to provide enough illumination for spotting, identifying and shooting your quarry, whether it’s rats, rabbits or foxes. Product description Control the night with the Night Master XSearcher IC. With ‘Intensity Control’ (IC) technology you can quickly adjust the brightness of the beam to provide enough illumination for spotting, identifying and shooting your quarry, whether it’s rats, rabbits or foxes. NIGHT MASTER 18650 BATTERY 2600mAh This is a high-power, lithium rechargeable battery provides hours of lamping time. There is no memory effect, so you can recharge it whenever you want to. 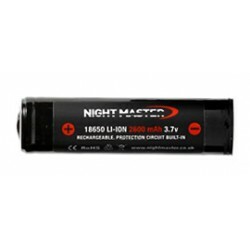 NIGHT MASTER 18650 BATTERY 3400mAh This is a high-power, lithium rechargeable battery provides hours of lamping time. There is no memory effect, so you can recharge it whenever you want to.